The CEL-712 Microdust Pro is a rugged, hand-held, data logging instrument for the real-time detection of airborne dusts, fumes and aerosols. It has a large colour display and a graphical facility, allowing the user to instantly view the dust level and trends. It is ideal for walkthrough surveys of ambient and indoor workplace environments. A quick, easy to use instrument, giving the user additional qualitative data which cannot be gained by gravimetric air sampling methods alone. This extremely versatile instrument can also be used with a range of accessories for static and size selective sampling applications. The CEL-712 Microdust Pro has the highest measurement range of any occupational dust measurement instrument available on the market. Up to 500 measurements can be taken and stored with the large memory. This data can be downloaded into Casella Insight Data Management Software, where it can be stored and analysed as necessary. Reports can easily be generated by location or person using the intuitive report wizard. The CEL-712 Microdust Pro can be used for spot checks and walk-through surveys with the advantage of seeing instantly when and where excessive dust levels are occurring. 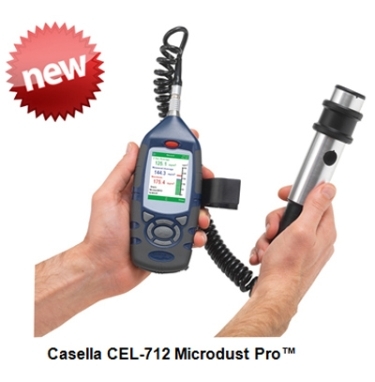 The CEL-712 Microdust Pro is incredibly easy to use with a simple interface. A user can be taking a measurement within seconds of starting the instrument. A calibration filter is used on site that provides a spot check of the instrument's linearity. This is unique to the marketplace as no other device currently has this capability. The screens are colour coded to ease navigation, once a measurement is started they turn green (shown below) or red when stopped. When taking a measurement, real-time instantaneous and average levels are shown and subsequently stored to the memory for review later. The instrument is factory calibrated using a method traceable back to isokinetic techniques and is conducted in a custombuilt wind tunnel using ISO 12103-1 A2 Fine test dust (Arizona road dust equivalent). Each probe is also supplied with its own unique Calibration Insert, which creates a known optical scattering effect in the probe's sampling chamber. This fixed reference can be used to confirm the original factory calibration point, although annual factory recalibration is recommended. Whilst the CEL-712 Microdust Pro comes factory calibrated, by using an optional TUFF Air Sampling Pump and gravimetric adaptor, user-defined dust-type settings may be obtained. This means that the user can calculate a correction factor for the actual type of dust being measured and ensures maximum accuracy for their particular application. The CEL-712 Microdust Pro can be downloaded to Casella Insight Data Management Software using the USB cable provided. Once downloaded, the time history of the dust level can be displayed and analysed as necessary, so the times and extent of particularly 'dusty' events can be seen. Measurements can be stored in relation to the person or area they were measured and reports can be produced showing the relevant data for multiple people or places as required. A number of accessories are available for use with the CEL-712 Microdust Pro. The size selective adaptor can be used in conjunction with an air sampling pump and PUF filters, such that the real time measurement will be of the required size fraction of dust. If just gravimetric calibration is required then the gravimetric adaptor can be used with an air sampling pump. The Dust Detective enclosure transforms the Microdust Pro into a short term environmental dust monitor. The Microdust Pro and a TUFF air sampling pump (purchased separately) are housed inside and can therefore provide continuous real-time and gravimetric dust measurements. PUF filters can be used with the Dust Detective to give PM10, respirable or PM2.5 size fractions. Part number CEL-712/K1: Instrument kit contains CEL-712 Microdust Pro, calibration insert, cleaning bellow, USB cable, 3 x AA batteries, Insight Data Management Software, instruction manual (on flash memory drive) and field guide. All housed in a briefcase style lockable case.